In 1897 Skagway was in the midst of the Gold Rush. Stampeders from all nationalities tumbled off steamships in the tiny port of Skagway bound for the Dawson Gold Fields. The rough tent town gave way to boardwalks, streets, framed houses, dance halls, shops and hotels. To commemorate Skagway's past, the guest rooms are named for the ladies who worked here in “Paradise Alley” of the Red Light District. Turn-of-the-century ambiance helps you soak in the history, mystery and magic of the Klondike Gold Rush. One hundred years later, Skagway retains the magic of the gold rush era. 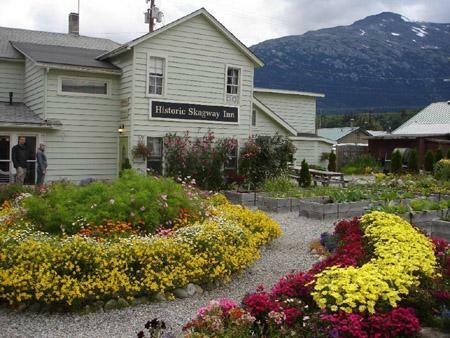 At the Historic Skagway Inn B&B, you will enjoy snowy white sheets, cozy rooms, period antiques, delicious meals and comfortable accommodations.